Supplier & Manufacturer of Goliath Crane. Our product range also comprises of EOT Crane and Jib Crane. Our organization is involved in offering its patrons a wide range of Crane. The products we offer are engineered by a team of qualified experts, employing hi-tech machines in adherence with industry laid norms. We offer a unique range of Goliath Crane which is an ideal material handling equipment for various industries. 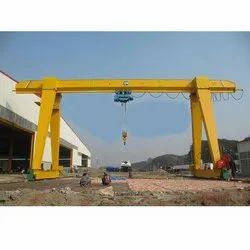 It is also known as Gantry Crane. These Goliath Crane can be available in both single girder type as well as double girder type. Manufactured using quality material, these indoor Industrial Goliath Crane & outdoor Industrial Goliath Crane are appreciated for their durability and optimum performance. We offer a unique range of Goliath Crane Single Gudder which is an ideal material handling equipment for various industries. These Goliath Crane can be available in both single girder type as well as double girder type. Manufactured using quality material, these indoor Industrial Goliath Crane & outdoor Industrial Goliath Crane are appreciated for their durability and optimum performance. We offer a unique range of Goliath Crane Double Gudder which is an ideal material handling equipment for various industries. These Goliath Crane can be available in both single girder type as well as double girder type. Manufactured using quality material, these indoor Industrial Goliath Crane & outdoor Industrial Goliath Crane are appreciated for their durability and optimum performance. Looking for Goliath Crane ?